Anacondas digest their meals like other snakes, through a process that is much different than that of other animals. But, because these snakes are so large, their prey is often large as well. The digestive process begins with the unique way snakes swallow their prey and ends much the same as with other animals. A background in the way it captures and eats its food is helpful in understanding the anaconda's digestive system. The anaconda is a large, powerful constrictor with sharp, rear-facing teeth that prevent its prey from wriggling free. The snake coils around its prey tightly, increasing its tightness around the animal while the animal suffocates. The snake then walks its jaws over its prey, working the animal down its esophagus. Like other snakes, the anaconda's lower jaws are not fused together, allowing them to move independently of each other and stretch out, working around prey that is much larger than the anaconda's head. The first step in digestion is getting the food to the stomach. Since anaconda's don't chew their food, swallowing is much different than in many other vertebrates. Inside the anaconda's mouth are several salivary glands. These glands moisten the food to aid the great snake in swallowing large prey. Also inside the mouth is the opening to its esophagus. Unlike many other vertebrates, the anaconda has two swallowing movements. The first is like that of other animals: esophagus muscles squeeze together and force the prey down. The second relies on the spine and body: the spine and body bend and make the anaconda's ribs push in against the food. If you were to watch an anaconda at dinner, it would look as though the snake is crawling its body over its food. The snake continues these two swallowing motions until the food has reached its stomach -- which is sometimes further than halfway down its body. The anaconda's stomach produces powerful enzymes and gastric juices that slowly start to digest the prey animal. The small intestine, which is divided into three distinct regions, continues to digest the food once it has passed from the anaconda's stomach; the liver and pancreas excrete and secrete powerful enzymes into the small intestine to aid the digestive process.The nutrients from the meal are absorbed in the small intestine. The food then passes into the large intestine, where the anaconda's body begins to process the waste material from the meal. Once the anaconda has devoured its meal, it then needs to find a safe place to digest it. The weight of the meal in the snake's stomach makes it difficult to move, so its body expends a lot of energy to digest large meals. The digestion process can take from several days to several weeks, depending on the temperature and the size of the meal. 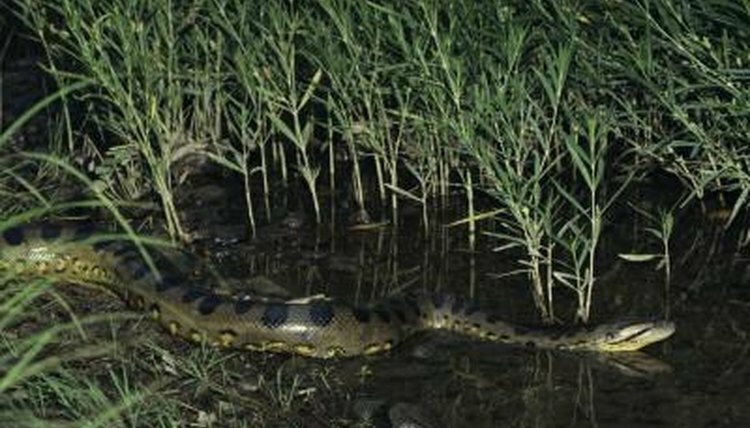 Because anacondas are warm-blooded, they require a warm place to speed up their metabolisms; a cold snake has a difficult time digesting food. Why Does a Frog Close Its Eyes Before Swallowing? What are an Anaconda's Food Sources? Does the Bull Snake Have Teeth?